Have you Thought about walking on water ? – not a bad idea. HOW DO SHIPS FLOAT BEING SO HEAVY ? I bet everyone would have ask this question to themselves at least once in a lifetime. My younger sister – a Linguistics Student also asked me this question. Well it feels good, even non Science people are interested ! Archimedes – who ran naked on streets due to excitement saying “Eureka…Eureka..!“(which means – I have found it) the whole time when he found the solution for the problem he was given to solve by the king to check the purity of crown. The problem was solved with the concept of buoyancy. When the weight of a body or object is less than the weight of the fluid it displaces !! 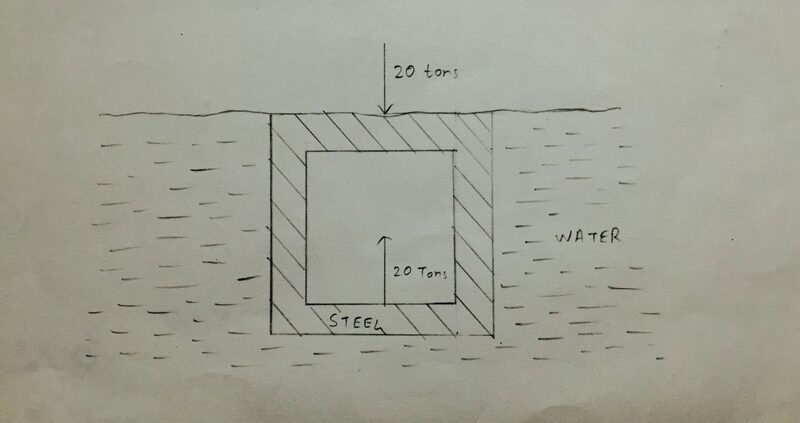 According to Archimedes principle, if u take a cube of volume 10 cubic meter weighing 20 metric tons & just push it into a lake, a buoyant force of 10 metric tons will push the cube upwards. Assume we are gifted a cube, made of steel, weighing 20 metric tons & having a volume of 10 cubic meter. We take the cube & toss it off into a sea nearby. What happened ? A big splash & cube straight to the bottom. 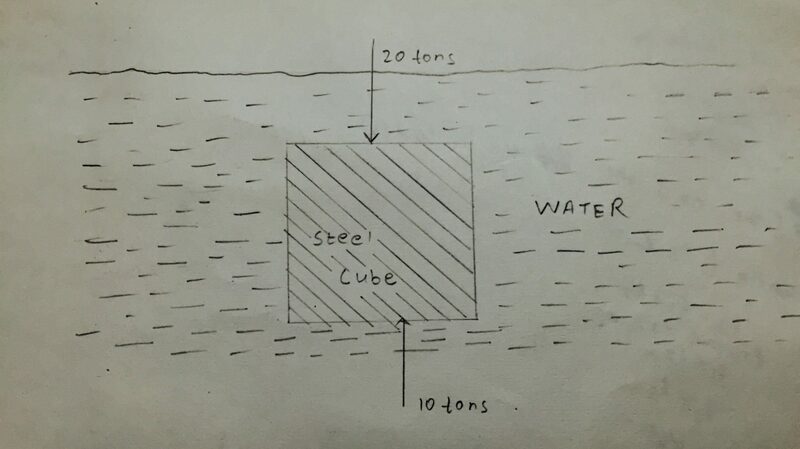 Well our cube having weight 20 tons, displaced 10 cubic meter of water & an upward buoyant force of 10 tons; Archimedes principle. So we have 10 tons more weight pulling our cube down than the buoyant force pushing upwards & our cube sank. In other words, THE CUBE’S WEIGHT IS MORE THAN THE WEIGHT OF WATER IT DISPLACED ! When the cube neither sinks nor floats. Now take the same cube weighing 20 tons & make some changes in it’s design. This time it’s volume is 20 cubic meter. Now we toss our cube again having same weight but a different volume. Again a big splash & yea just near to the surface of water. It is inside the water but it doesn’t sink. This is also called neutral buoyancy. Here, THE WEIGHT OF OUR CUBE IS EQUAL TO THE WEIGHT OF WATER IT DISPLACED. But oops, it is of no use… so we pull it up again & continue our research. This time, again improvising the design of cube & increasing it’s volume to 30 cubic meter keeping the weight 20 tons. Back to the sea with tons of excitement, we toss it again & what ? – IT FLOATS ! Congratulations, you just made a ship which doesn’t look like a ship. Butttt, what matters is – It floats. This timeTHE WEIGHT OF OUR CUBE IS LESS THAN TO THE WEIGHT OF WATER WHICH IT WILL DISPLACE. And done, here we go, keeping the weight same we made it float. Now even if some people just get on-board on our ship, don’t worry ! Our ship will get more submerged into water, but HELL YEAH… it still floats & that becomes a Cruise ship; add cargo on it & it becomes a Cargo ship. Feel Free to Visit our School Swimming Pool for Practice before you visit your village Stream or River..